Garden tours are one of my favorite things to do when I am on the road. 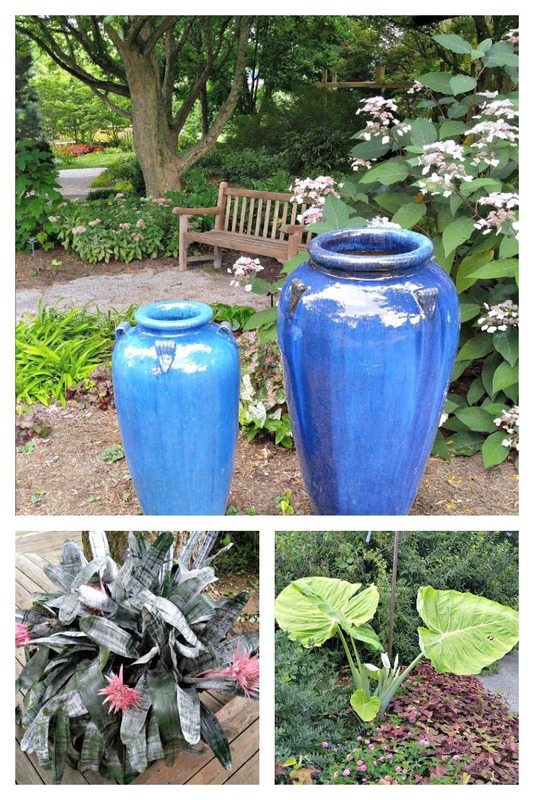 I love touring Botanical Gardens that I have not previously visited and sharing details and photos of them with my readers. 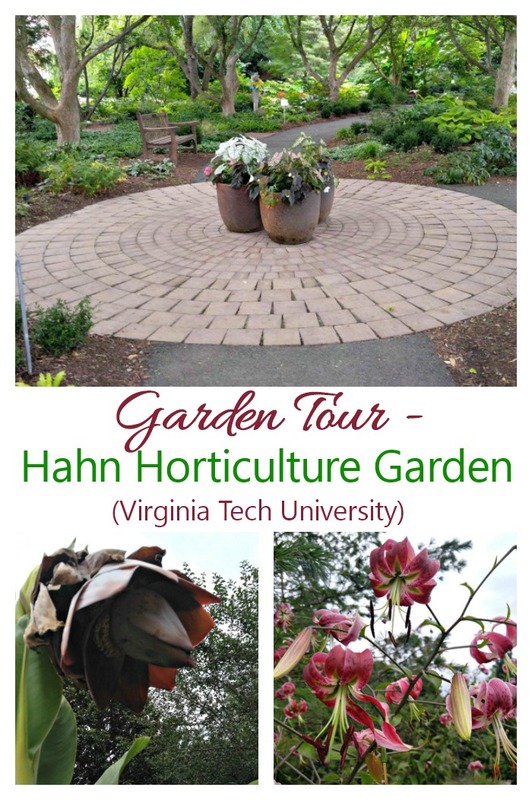 Today we will visit Hahn Horticulture Garden in Blacksburg, Virginia. This Horticulture Gardens are set on 6 acres of land and it features teaching and display gardens on the campus of Virginia Tech. It was established in 1984 and serves as a teaching area for undergraduate students and a wonderful place for the local community and tourists to visit. According to Wikipedia, the definition of horticulture is the science and art of growing plants . It also includes plant conservation, landscape restoration, soil management, landscape and garden design, construction, and maintenance, and arboriculture. It stands to reason that a state university offering degrees in environmental plant science topics would have wonderful gardens to tour, and they do not disappoint! The garden has a nice combination of water gardens, shade gardens (my favorites!) and loads of plants, both annuals and perennials. 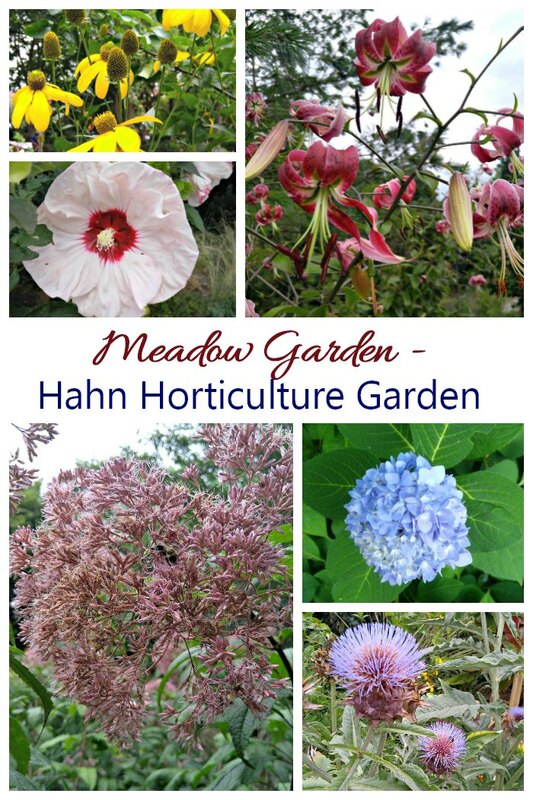 Grab a cup of coffee and join me as I tour this amazing garden. Approaching the entry to the horticulture garden, one would not expect what treasures lie inside the University. The grounds are meticulously groomed, but give just a hint of the gardens inside. I have a great fondness for shade gardens, and was pleasantly surprised that our entry on the north west side of the garden featured over an acre of shrubs, perennials and trees suited to growing in shade. This area of the garden had an arbor covered in wisteria which was a perfect spot to relax or have some lunch. 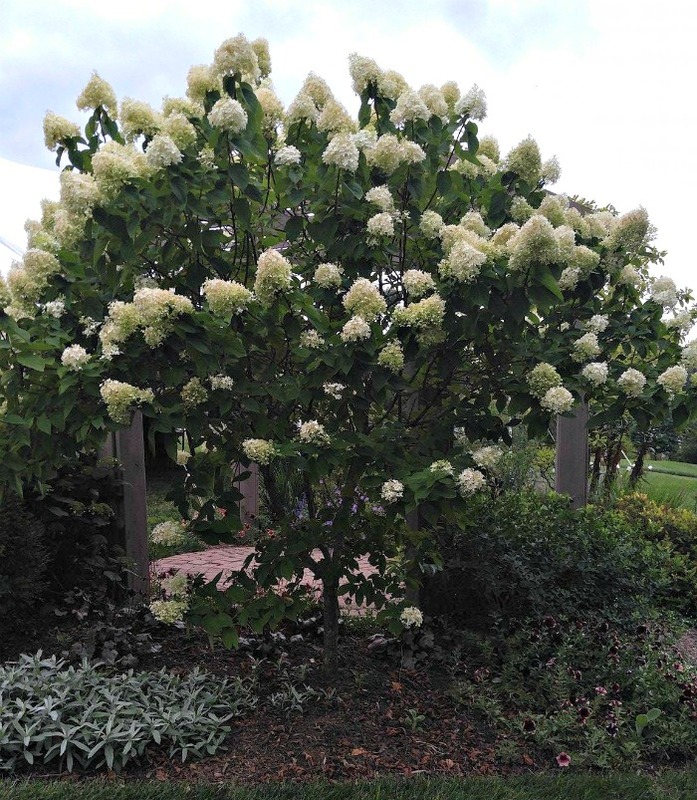 Paniculata hydrangeas were trained into trees and dotted this area and were a delight to admire. The trees in the Trident Maple Allee were large and very mature and were underplanted with annuals and perennials, with a lot of hostas, which I especially enjoy growing and learning about. On one side of the shade gardens is the small pond area. It has been newly renovated and adds lots of lushness and drama with many tropicals growing in this area. Seating areas abound for a place to sit and admire the surroundings. 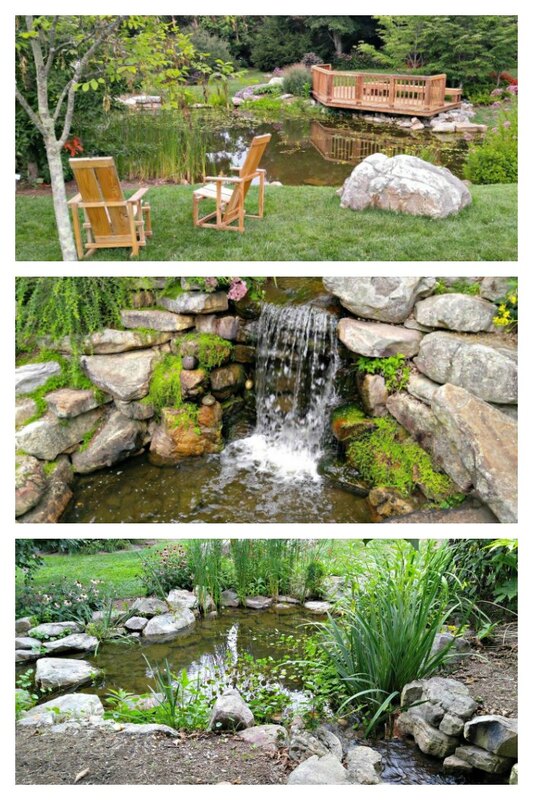 There is also a long Memorial stream garden on the opposite side of the shade garden with a 200 foot long water feature, and water full of Koi and goldfish, as well as dozens of bog and aquatic plants. The Xeriscape Garden had also been recently renovated when we visited and it boasts a fabulous array of drought tolerant plant of all types. It gave me lots of ideas for plantings for my succulent garden in North Carolina. 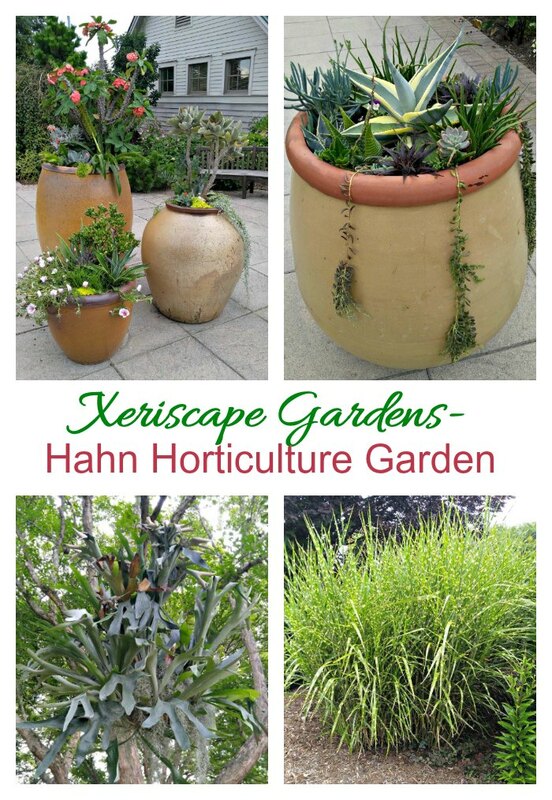 Xeriscape gardening is a type of landscape design which features plants that require little or no irrigation. They are found in dry areas of the country, such as Arizona and New Mexico plus many areas of California and neighboring states. 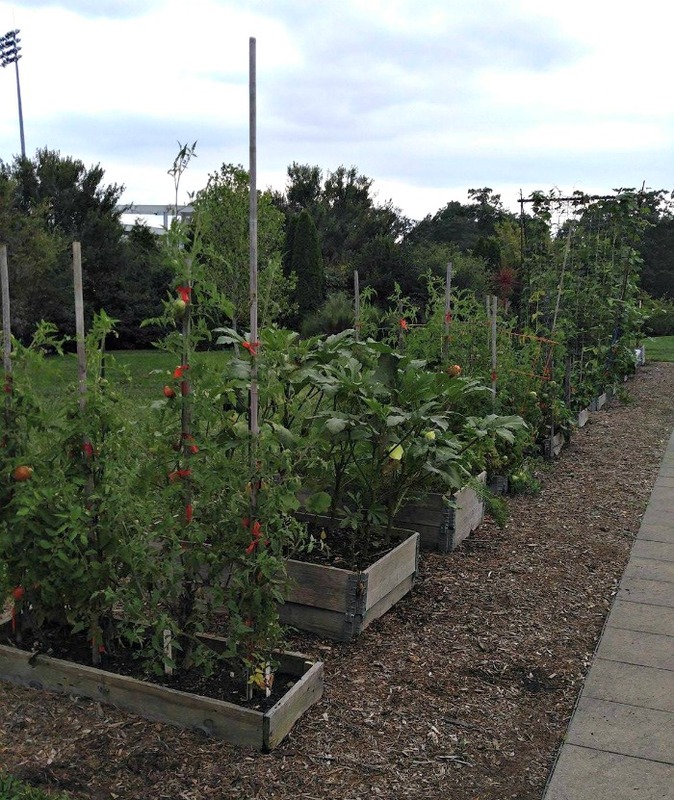 Near the visitor center was a small edible garden in raised garden beds for ease of maintenance. The tomato plants were full of cherry tomatoes and it was hard not to sneak one or two! 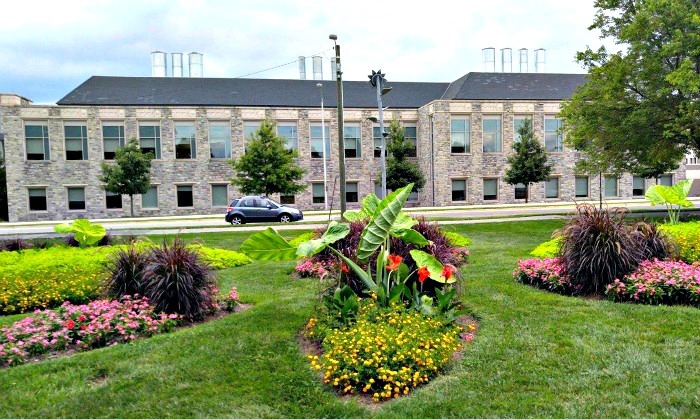 The newest addition to the Virginia Tech Horticulture Garden is the Meadow Garden. It is located along the Southwestern side of the Gardens. This area features Native plants species and cultivars. 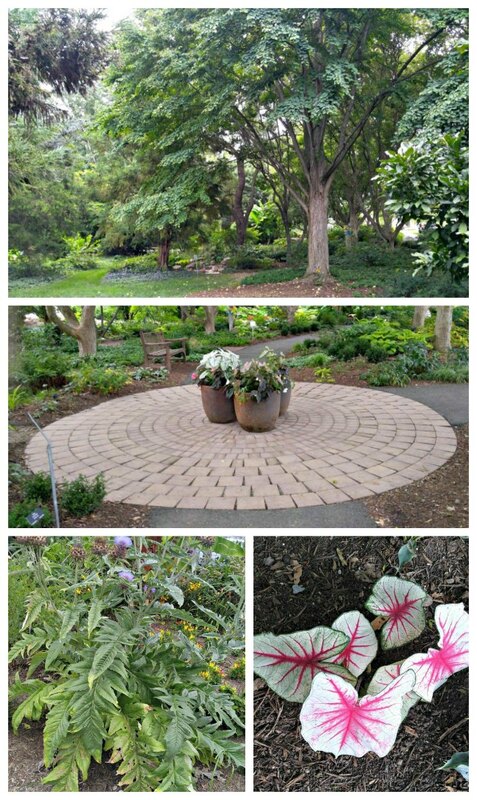 This area of the garden center has a winding path that snakes through the area and also boasts many unusual varieties of plants along the outside edges of the trail. I was struck by a fully grown ensete plant in flower. 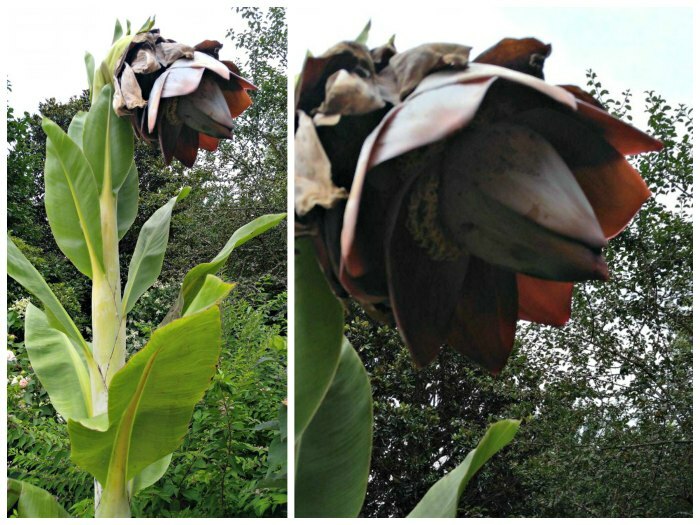 It is a member of the banana family and the head of the plant was huge! One general feature of the gardens was the abundance of garden art on display featuring local artisans. 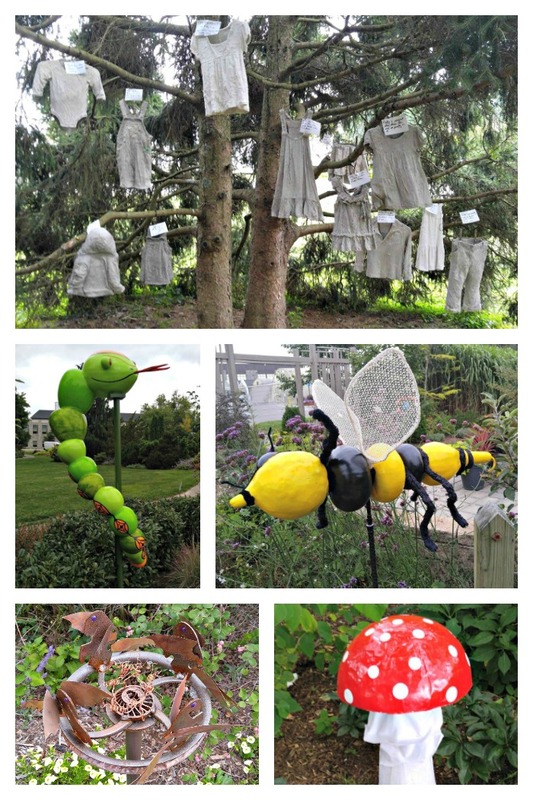 From a section devoted to garden art made from gourds to copper and metal art and a whole area called Granny’s Closet featuring hanging pieces of formed children’s clothing, there was something for the tastes of everyone who loves garden art. Other areas of the garden boast a conifer display, the spectrum border, annual beds and a bright perennial border with a festive display of perennials and flowering shrubs. Seating areas abound so that you can rest and enjoy the surroundings and the array of plants is just amazing. Whatever you are looking for in a garden display, you are likely to find it at Hahn Horticulture Garden in Blacksburg, Virginia. The Gardens also has a Junior Master Gardener Youth Program. The event is modeled on their adult Master Gardener program that offers horticulture classes and environmental science education through creative gardening activities. There are 26 classes that take place over the fall and spring months. The program is open to all Virginia county youth in grades 3-5. This would be a great program if you have a child who shows an interest in jobs in horticulture. You can get more details about the program here. All are well worth a visit.